For customers who’ve used RideMax recently to plan a visit to Walt Disney World, you know that you can tell RideMax which attractions you wish to use FastPass+ (FP+) for, and the software will work those FP+ reservations into your RideMax itinerary. Up until early last month, the only mode RideMax supported was that it would tell you the time of day at which it expected you to use those FP+ reservations, and it expected you to make the necessary adjustments in Disney’s online reservation system to match the times shown on the RideMax plan. This worked OK for someone making FP+ reservations well in advance (which I still advise), but what about those situations where there were only a couple of FP+ “time slots” available in Disney’s system, and you simply couldn’t get the reservation times to match up with your RideMax plan? 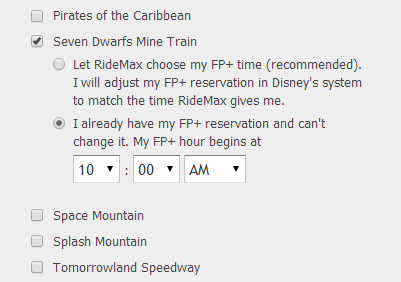 As you can see in the screenshot above, once you check a given FP+ attraction in the list, RideMax now gives you two options: you can either allow RideMax to tell you what time to make your reservation for (same as was supported previously), or you can tell RideMax when your existing FP+ reservation begins. Note that it’s still better if you can allow RideMax to tell you when to use your FP+ reservation, as this can result in more efficient plans. I also believe that RideMax is the only Disney planning tool that offers this option. I’ll probably post a more detailed example on this at some point in the future, but just to explain briefly why you may want RideMax to choose your times for you, if the most optimum plan for your list of attractions is to have you visiting the rides in Tomorrowland at 11am (for example), but you tell the system you have a FP+ reservation at Splash Mountain at that time, the reservation will place you on the opposite side of the park from where you “should be” if you allowed RideMax to choose the time for you. Having said all of that, I know there are simply occasions where you just can’t get the FP+ time slot RideMax recommends, and the closer you get to your visit date, the less flexibility you have to change reservation times in Disney’s system. If you find yourself in this situation, I hope you find the new feature helpful.